If you’re like me, you like to research the best products before you buy them. I used to just buy whatever looked pretty or smelled nice, just because it made that good first impression. But it is so disappointing when a product turns out to be lacking, or worse, detrimental. Now, whenever I consider a product, I like to search for it on Amazon. Reading reviews beforehand improves the chance that you are satisfied with your purchase. For example, whenever I am thinking of getting something new at Sephora, I skim through the product reviews online and make a list of potential buys. Then I go into my local store and ask one of the store employees what they think about the products I’m considering. More often than not, they will give you their honest opinion. As someone who works in retail, I know that we much prefer a satisfied customer. Any commission you make off of a bad sale might come back to haunt you in the form of a return, as opposed to a happy customer more likely to come back and buy from you again! With that in mind, I thought I would start a new segment called Top Five, where I would clue you in to some of my favorite products, brands, etc. I have cultivated different aspects of my life through A LOT of trial-and-error. I’ve tried on lots of clothes, tested tons of beauty products, and made many recipes, and I want to help others find the best of the best without wasting time and money. So, for my first five, I give you my favorite face masks! 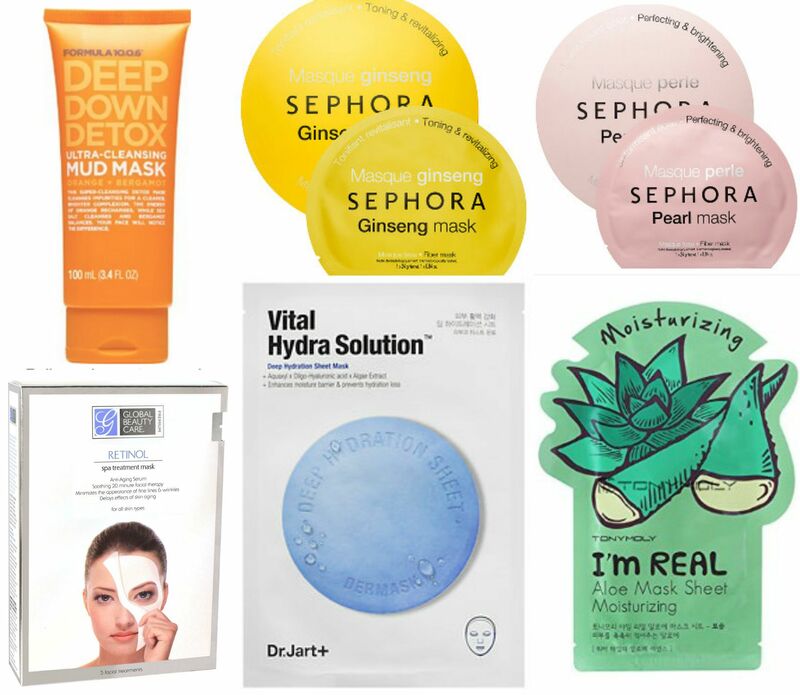 Formula 10.0.6 Deep Down Detox – I realize that this is the only non-sheet mask on this list. This is not to say that there aren’t tons of great mud masks out there, but personally, I find that my skin responds better to sheet masks. You can read more about my love for them here. Sephora Collection Sheet Masks in ‘Ginseng’ and ‘Pearl’ – These two are from the same awesome line, so I’m counting them as one haha. The ginseng mask is a new discovery of mine. I wore this before putting my makeup on today and my skin was toned and glowing, plus my makeup was flawless all night, even in 90-degree Boston humidity. The pearl mask is a great dupe for Shiseido’s White Lucent Power Brightening Masks. I splurged on a box of those a few years ago, and they do make your skin incredibly glow-y and bright. But at $68 for 6 masks, I just couldn’t justify it. You know how many Sephora masks you can get for $68? 11! TonyMoly I’m Real Skin Care Sheet Mask in Aloe – I’ve sung the praises of this mask before, but I’m putting it on here again because of all the masks on this list, it has the most refreshing scent and the most liquid. Sephora sells these in packs of 2 for $7.50, but I found them on Amazon in a pack of 10 for less than $15! I clued some of the Sephora ladies in to this great deal, and I know a few of them have taken advantage of it too! Dr. Jart+ Dermask Water Jet Vital Hydra Solution – Don’t let the sophisticated-sounding name fool you; this mask will hydrate your skin and make it glow, plain and simple. It smells nice, the sheet is smooth, and I woke up glowing but not broken-out. LOVE! Global Beauty Care Premium Retinol Spa Treatment Mask – Retinol and Vitamin A are the best things for you skin. This mask is my #1 because it is such an awesome multitasker: it does double duty, preventing aging AND dealing with acne. Online, the cheapest I’ve found is on the company website, but in New York, Harmon’s sells the same box for only $7. I have my best friend buying them for me in bulk! So that’s five awesome favorites right there! As usual, I was wearing a sheet mask while writing this (#4 to be specific), so you know I’m serious about these babes. Live beautifully!